Streamlined. Smart. Sensational. 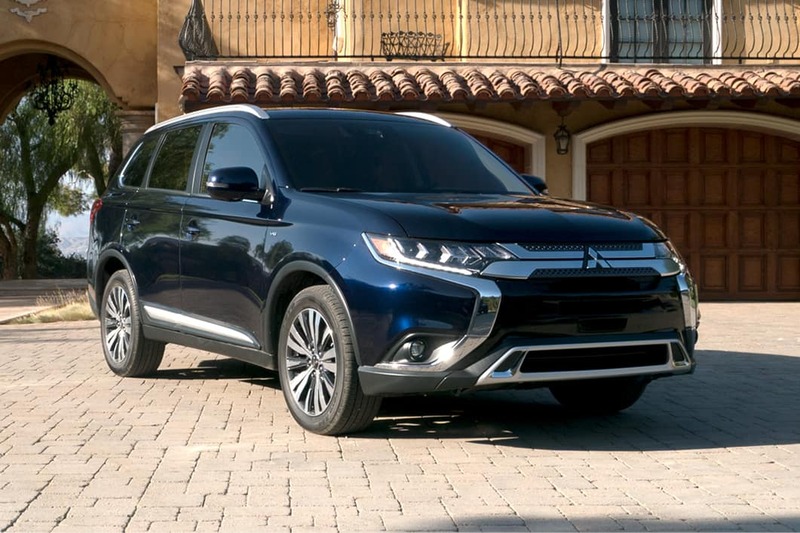 The 2019 Mitsubishi Outlander is the complete package, and it’s available for a test drive here at our new car dealership in Clarksville, IN. If you need a family vehicle that’s big enough to handle your busy life, you simply can’t go wrong with this new Mitsubishi SUV. The 2019 Mitsubishi Outlander has room for everyone and everything you need to bring along on your next trip. This new SUV comes with seating for seven and 10.3 cubic feet of cargo space. If you need to haul more items in the cabin, the second- and third-row seats both fold down and create 63.3 cubic feet of total storage volume. You’ll also have the necessary power to get where you need to go, thanks to the 2.4-liter four-cylinder engine worth 166 horsepower and 162 lb-ft of torque. The top trim comes equipped with the 3.0-liter V6, which churns out 224 horsepower and 215 lb-ft of torque. With the former powertrain, a CVT is paired, while the V6 features a six-speed electronic automatic transmission. And when it comes to towing, the Outlander for sale offers a maximum 3,500-lb capacity. Entrust your family to the 2019 Mitsubishi Outlander near Louisville, KY, thanks to advanced safety features like available Adaptive Cruise Control, Rear Cross Traffic Alert, Blind Spot Warning, and Forward Collision Mitigation. When it comes to your time on the road, this new SUV comes equipped with traction control logic, hill start assist, active stability control, and available all-wheel control. You’ll have all the in-car technology you need right within reach in this new Mitsubishi for sale. A seven-inch touchscreen display comes standard, along with Bluetooth®, digital HD radio, and USB connectivity. Top trims add a bevy of options, including smart device connectivity with Apple CarPlay™ and Android Auto™ and the premium nine-speaker Rockford-Fosgate® audio system. SiriusXM® satellite radio is also offered, providing a diverse range of music, talk, and sports stations. To buy or lease the 2019 Mitsubishi Outlander, head to Mitsubishi Store Clarksville, located at 1590 Greentree Blvd. Our friendly and professional sales staff is happy to set you up on a test drive and answer any questions you have!